Cumbria’s Police and Crime Commissioner Peter McCall was delighted to meet up with youngsters from Aspatria Hornets Amateur Rugby League FC Youth Section at one of their recent training sessions. The Aspatria Hornets recently received £1,000 from the Commissioner’s Property Fund, which has enabled them to purchase new training equipment and train a number of new coaches to meet the ever-expanding junior section. 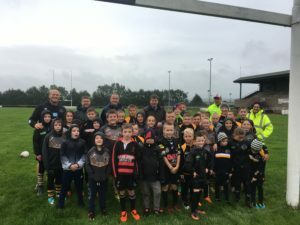 Speaking of his visit, Peter McCall said: “I was keen to accept the invitation to go along and watch the Aspatria Hornets youngsters in one of their training sessions, to see first-hand the benefits that the new equipment has brought for them. I am a firm believer that by encouraging young people to participate in a healthy, positive, inclusive activity that will provide a confidence boosting experience often helps to steer them away from negative behaviours, such as getting involved in anti-social behaviour. “Many of the people I meet say that anti-social behaviour caused by young people is an area of concern in their communities, which is why I believe it is important for me to fund activities such as this. However, the police alone cannot solve the problems, and it is only by us working together with clubs like the Aspatria Hornets, that we will be able to really make a difference. My vision is ‘we – not they’, and this is a great example of one of the ways we can make this a reality. The Police and Crime Commissioner has power to distribute funds accumulated in the above fund as a result of the disposal of property coming into the possession of the police by the Police (Property) Act 1897 and The Powers of Criminal Courts Act 1973.